CHICAGO, IL (2/21/2012) – Gen. George S. Patton was distracted. Looking out the window at the destruction along the road in Germany, he spoke to Maj. Gen. Hobart Gay - his chief of staff when he commanded the Third Army - about the waste of war. He did not see the 2.5 ton truck driven by Tech. Sgt. Robert L. Thompson. Perhaps he did not hear Gay, or Pfc. Horace Woodring, the driver, telling him to brace himself. As the truck collided with the staff car, the 6-foot 3-inch Patton was thrown forward. He hit his forehead on a clock mounted on the rear of the front seat. At first, it looked like he only had minor cuts; however, at the hospital in Heidelberg doctors discovered Patton had broken his neck and was paralyzed. On Dec. 21, 1945, he died of a pulmonary embolism. Not to be clich�, said Jones, but perhaps it was just his time. Or maybe it was for the best, he added. Patton already had his orders, he was going to fly to the U.S. on Dec. 10 and retire. “Could you imagine Patton not in the Army?” asked Jones, a veteran of the 10st Airborne Division, who was in the initial push into Baghdad in 2003. Regardless of the rivalry between the infantry and cavalry, Patton is one of the people Jones would choose if he could pick five people dead or alive to talk to. And he was excited to be able to share his love for Patton, who he called “a living contradiction,” in February with people at the Chicago Auto Show at the McCormick Place Convention. It's not surprising the first time the infamous 1938 Series 75 Cadillac left the museum it visited Chicago. One of Patton's first assignments as a second lieutenant was at Fort Sheridan, north of the city, Jones said. “This is the one he had the wreck in?” asked Charles Tashiro, 46, of Greenwood, Ind. Jones answered, “Yes,” while nodding his head. Tashiro, who graduated from basic training in 1986 at Fort Knox, Ky., said it meant a lot to see the museum making an effort to bring more visibility to the history of the cavalry. “This is so cool,” Tashiro said. Connie Panek, 66, of Schaumburg, Ill., was also thrilled. Capt. 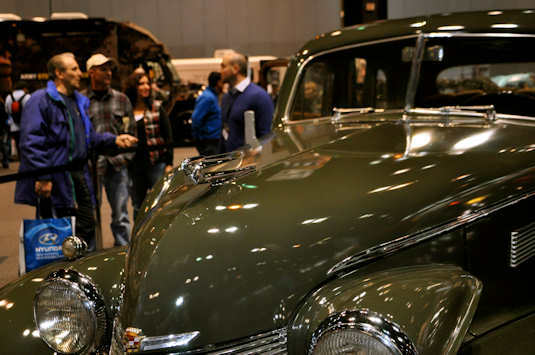 Brandon Sellers, 31, operations officer for the U.S. Army Recruiting Battalion Chicago, said the 1938 Cadillac offered a perfect juxtaposition to the Science, Technology, Engineering, and Math van. This marks the sixth year the Chicago Army Recruiting Battalion has participated at the show, which ran from Feb. 10-19. “Patton is one of the most highly recognized and colorful leaders of our past. To share his story with the new soldiers, the future of the Army, is another wonderful opportunity the Army Reserve and the Army offers here at the auto show,” Sellers said.